The NEW Globe myLIFESTYLE Plan - All Chucked Up! 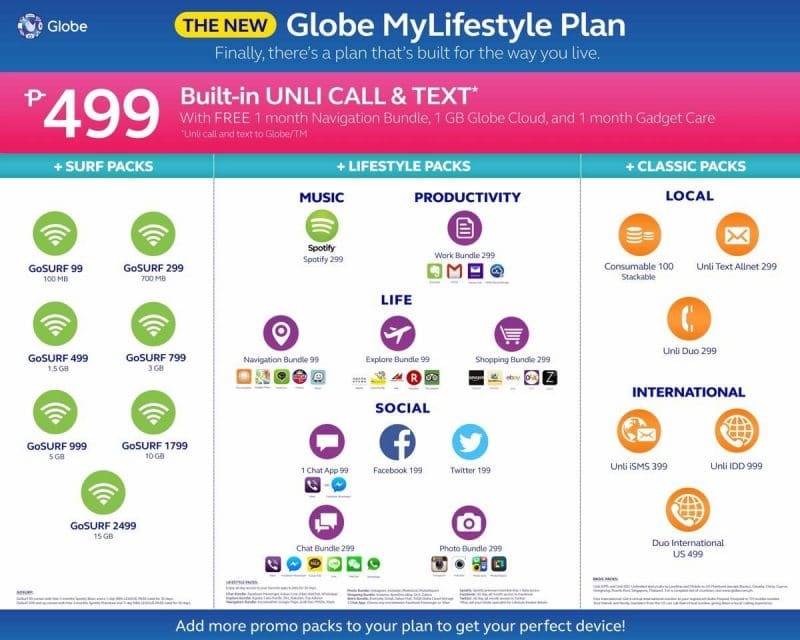 Globe myLIFESTYLE Plan is the newest plan offer from Globe Postpaid. With it, everything will be simpler as there will only be one plan: all-month calls and texts to Globe/TM for only Php499. Other services can be availed on top of it, also known as Promo Packs (formerly Boosters), so you can still customize your plan to fit your lifestyle and needs. Best of all, the more promo packs you add, the better the handset you can get. It’s that simple! then select a FREE mobile phone that corresponds to your accumulated amount. then choose your mobile and data add-ons adding up to the same amount of said monthly plan. 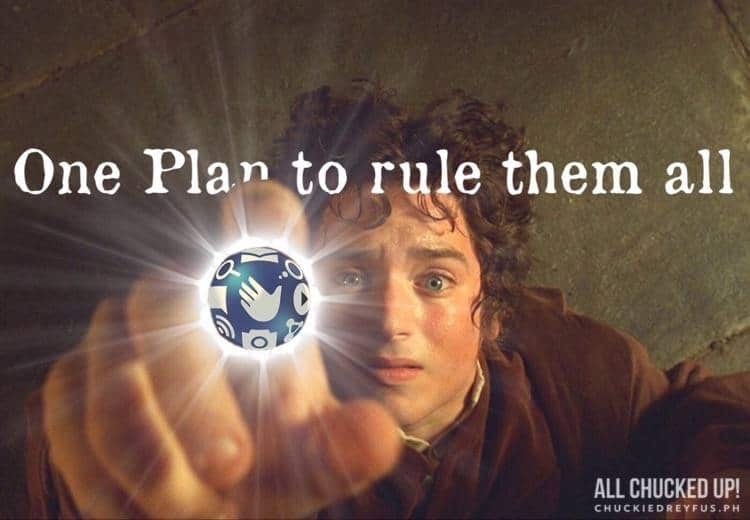 Let’s create a Globe myLIFESTYLE Plan via Option 1. The 499 Built-in UNLI-CALL & TEXT is mandatory. Let’s pretend I’m a moderate mobile data user and consume around 5GBs a month. Looking at the available Surf Packs being offered, that means I’ll be going for the GoSURF 999 (5GB). Music is a must for me especially when I go out for a run or during travel. So, looking at the available Lifestyle Packs, I’ll be getting the Spotify 299 (which has an allotted FREE 1GB of data streaming before it eats up on your GoSURF data). I love keeping in touch with friends as well as fans on Facebook. Naturally, getting the Facebook 199 Lifestyle Pack is a must. Getting around during tapings and finding remote locations can be quite a problem unless I have access to my ever dependable Waze and Google Maps app. And since I travel quite often, it’s pretty much a no brainer that I need to get the Navigation Bundle 99. I occasionally make calls to landline numbers and need people to access me through my very own landline number as well. Grabbing the Unli Duo 299 from the Classic Packs selection solves my concern in no time. Browsing through the Globe myLIFESTYLE Plan device chart, I clearly fall under Plan 2499. Currently, the smartphones under this plan (which I can choose from) are the LG G3, Samsung Galaxy S4 and Samsung Galaxy S5 (with a Php 7,200 cashout). Deducting 2,394.00 from my Plan 2499, I still have a remaining consumable amount of Php 105.00 which I can use up for services such as calls or SMS to other networks. Let’s create a Globe myLIFESTYLE Plan via Option 2. This is basically a reversed approach to Option 1. 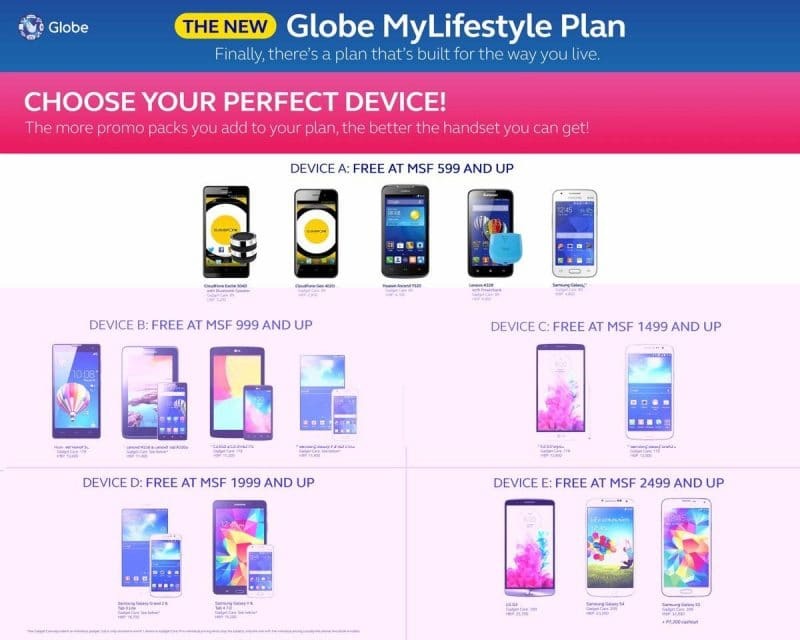 Using this method, I begin by choosing the kind of Globe myLIFESTYLE Plan that I want (including a choice from its corresponding smartphones). Let’s pretend for a second that I only want to spend roughly Php 2,000.00 a month for a mobile plan. That means, I would choose Globe myLifestyle Plan 1999. For devices under this particular plan, I can choose from the Samsung Galaxy Grand 2 & Tab 3 Lite or the Samsung Galaxy V & Tab 4 7.0. Knowing that I have an allotted amount of 1,999.00, I can easily work around that figure to mix and match the kinds of SURF, LIFESTYLE and CLASSIC PACKS that are important to me. That gives us a total amount of Php 1,895.00. Deducting Php 1,895.00 from my preferred Globe myLIFESTYLE Plan 1999, I still have a remaining consumable amount of Php 104.00. Nice! It’s incredibly easy to play around with the selections found in the SURF, LIFESTYLE and CLASSIC Packs in order to tailor-fit it to your kind of lifestyle. That’s exactly why this new offering is called the Globe myLIFESTYLE Plan. It’s a great time to grab a postpaid line and have the time of your life doing the things you love using your smartphone. Switch to the new Globe myLIFESTYLE Plan and rest easy knowing that Globe and your device has got you covered. ‹ Hanamaruken Ramen at The Grove by Rockwell › FREE Facebook and FREE Viber from Globe! Share Your Vibe! You may keep your existing unlimited data plan (which i suppose is the unlisurf999 plan) for as long as you want. Just DO NOT re-contract with Globe, meaning you DO NOT sign another contract with a lock-in period because you availed of a new mobile phone unit. If you sign a new contract, you would have to choose from their current plan lineup which is really not good for people who are heavy internet users with their mobile because of the GB limit. So to keep your unlidata plan, use it as you normally do. Pay your monthly bill. Do NOT make changes on your plan: no downgrade, no upgrade. Hope thhis helps :) have a great day! Glad to know that we could keep our old plan, however I’m keeping it because of its better deal and 350php monthly bill rebates. If i don’t recontract, they would maintain my account at the old plan 999 without the rebates. I called them and they are offering me to switch to new lifestyle plan and they would give me rebates, but it’s lower. It’s only 300php bill rebates for plan 999. In my current plan, i maintain the blackberry 999 plan. And the 350pesos bill rebates. Unlicall and text to globe. Is it worth it to stay with globe or time to switch to a better network provider? Sorry to disagree with you, but I’m not too happy with the new myLIFESTYLE plan. I think it is a lot of cr_p. They just want to squeeze out as much money as they can from users. The one who thought of this concept is either crazy, or a hopeless suckup to Globe management. Why bunch up these apps into lifestyle packs? So you pay a lot more even if you prefer to use only one app in the group. If you use viber, do you also really use wechat, whatsapp, line, and kakao talk? I don’t think so. Take me for example, I am content with my plan999 unlimited internet because it gives me the freedom to go to any website I want, use any app I want, as long as I do not abuse the fair use policy of globe. This plan also comes with 200 text messages and 10 mins of calls to globe. This is how I like it, this is perfect. Now why fix if it ain’t broke? Cause they want more money. 499 Baseplan. Why are they not giving us a choice? What if I do not want unlimited calls and texts to globe? I’m not a heavy texter or caller. I only send 200 texts (200pesos worth) average. I would be wasting my hard earned php300 because they are not giving me a choice to spend less. 999 Gosurf. This one I think is fair for 5GB. In my current plan999, my average internet consumption is 4-5 GB a month. 100 Consumable. With the new myLIFESTYLE, I will have to add this to my plan. Whereas before, this is a perk/freebie. So you see, I cannot agree with you that this is a better deal. I agree with you, though, that this is simpler. This is for those who are simple minded, who prefer not to think and those who are easily confused. Thanks for blogging about this, Chuckie. More power to you and have a happy new year. Jen is right. Actually, we have same thoughts. Im n0t a heavy texter or caller. The 499 unlimited text and calls to globe/tm is t0o much for me. Why should i text that much if there’s fb, viber, kaka0 talk etc. I kn0w that m0st of the pe0ple n0wadays were usually 0nline. Call is made if it’s urgent or if I need an immediate resp0nse. I hate the plan coz 499 is required and t0o much. They should take it as an opti0n c0z it’s not a lifestyle plan anym0re. I will n0t rec0ntract with them anym0re. I’ll just pers0nally register to gosurf. My unlisurf999 contract will end next month what if i will not re contract what will happen to my unli internet? From what I know, if you don’t renew, you will be charged Php 2.00/MB instead. Best to get a GoSURF data plan. Hi. If you do not recontract with Globe, your plan stays the same. Globe cannot and will not force you to change your current plan (even after the lock-in period) into another plan. Although, if you want to avail of a new phone from Globe, you would have to choose a plan from the their current MyLifetsyle Plan line-up. If you’re happy with your current unlisurf999 plan and wan to retain it, just continue using it–do not downgrade nor upgrade because you would have to choose from their current line-up. 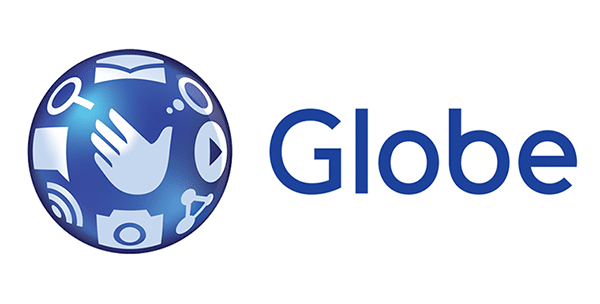 You can keep your unlisurf999 plan for as long as Globe is around. My sister’s Globe plan until now is still the old 250/month plan which have lots of free call minutes and free sms. This plan will work with people who are into calling and texting others who are also within the Globe network, but for me personally, I don’t find it appealing. Although this is a more simple plan, you really couldn’t tailor it according to your needs without having to pay extra. Take for example myself. I am into the MyBestEverSuperPlan 499 and even if I really don’t get the unlimited call and text within the Globe network (which is an overkill), I have a 900PV which I customized to 5 All Net Combo 5 min (500 All Net Text and 25 minutes All Net Calls) that is just right for me, and more importantly GoSurf 499 (1.5Gb of data). If I would go for MyLifeStyle Plan I would need to pay an additional of 499 just to avail of the GoSurf 499 plus the base plan of 499, that only offers unli call and text within the Globe network, so I’ll end up paying almost a grand in a month! Yes they are removing the mybesteversuper plan and replacing it with MyLifestyle Plan. But if you are an existing MyBestEverSuperPlan subscriber, you may keep your plan as long as you do not re-contract with Globe, that is you do not sign a contract with lock-in period. Thank you so so much tm7. You just gave me piece of mind. I always buy my own phones anyway so i never will recontract with globe and get to keep my 299 BESP. This means that to get the most out of the plan, you only need to add a Surf plan to the 499 base plan. The anti-bill shock of GoSurf 99 makes sure that your bill for GoSurf would never exceed Php 1500 regardless of how much data you consume. Your bill with this plan will therefore range only from Php 598 to Php 1999 (499 Unli Call/Text + 1500 bill shock). Getting any of the lifestyle packs in the MyLifestyle Plan would be a stupid move, especially due to the No Bill Shock guarantee. And as far as I know, the GoSurf is required in the MyLifestyle Plan. The new mylifestyle plan does not let users retain their duo landline numbers. Not a logical choice in my case as its quite difficult to let 400+ contacts know a new land line number that I’ve had for over 6 years. Not a good plan at all! Very limited options and the P499 minimum is overkill for those that don’t need unlimited sms and calls to Globe numbers only. Bakit bumabagal ang internet ? Imbes na iupgrade lalong humihina dahl sa fup. I came across the new MyLifestyle Plan as I have plans of downgrading since I don’t need to get a new phone (I’m happy with my iPhone 5 availed with 1799 [old] Plan). But ‘lo and behold…. I am welcomed with this only-choice for a Plan: a locked-up unlimited Globe calls & text 499php base plan that I don’t really need! My besteversuper plan P1799 contract will end in December. I was paying P1,100 for the iPhone unit each month. I’m happy with my 5s but want to continue my plan and not recontract. Will my P1,799 bill decrease to P699 now that I have paid off the unit? And will I be able to keep my unli-surf more importantly? Hello, Chuck. I have read on several blogs and even in Globe Community that best ever superplan is not already available instead replaced by lifestyle plan. My contract of superplan 999 ends this February 2016 and weighing from options such as recontracting, getting a new handset as loyalty or loyalty rewards such as diminished payment for the plan. I have known already that getting a new phone will bind you to a new lifestyle plan and also by choosing a recontracting. My concern is I have no idea that if ever you would avail of the loyalty reward such as deducting Php300 from your monthly bill of Ph999, you can retain your same plan, or you are force to change/recontracting to a new lifestyle plan once you avail the said option. Thanks and hope to hear from you. This is exactly my disappointing dilemma. This would be my third recontracting with globe if ever. In my first recontract, they gave me 450php monthly bill rebates for retaining the same plan of 999. On my second recontracting, they reduced my bill rebates to 350php. And now for the third recontracting , they are further reducing my bill rebates to 300php, and i will only be able to get that rebate if i will recontract again with their new lifestyle plan. They are deliberately forcing customers to switch to the new plan, because they said i could keep my old plan but bill rebates won’t be applied anymore unless i signed up for the new one. I’m thinking if switching to a new network will be a better option.